Can only see the rally pack online but they also had the Formula 1 pack and Endurance pack instore too. IF it is the EDURANCE pack as well. As they seel for £20 to £30 on ebay. without doubt the best toy/game when I was a weeeee youngster, even better than chess! Very good price. Can never be too old for scalextric.....heat added! Is this just 2 cars or is there track included??? check I donot think they will fit the standard track as they are called Scalextric Start. "Accelerate into the new world of 1:32 scale slot racing with Scalextric Start - where the racing begins and the action never stops! 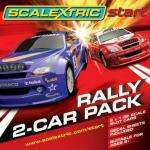 This cool Scalextric Start Cars 2 Car Pack vehicles are suitable for use with Scalextric Start tracks and all standard Scalextric tracks." Tesco is selling Micro Scalextric GT Thunder £80 down to £40. I no idea about scalextric though??? To run Start cars on Scalextric Digital, they will need fitting with a retro-fit chip, C7005 is the best one to use. In the F1 car the driver detail is moulded into the body and there is no seat, or driver legs to get in the way, so the chip can be placed vertically in the usual position or laid flat to the underpan. The Le Mans car has a channel running down the centre which the C7005 chip sits nicely inside. Cars don't have chip mounting points but the LED hole is pre-drilled. Buy ten and get free delivery!